Because read operations are mapped to snapshot isolation transaction level, the cleanup of ghost records on the primary replica can be blocked by transactions on one or more secondary replicas. The ghost record cleanup task will automatically clean up the ghost records for disk-based tables on the primary replica when they are no longer needed by any secondary replica. This is similar to what is done when you run transaction(s) on the primary replica. In the extreme case on the secondary database, you will need to kill a long running read-query that is blocking the ghost cleanup. Note, the ghost clean can be blocked if the secondary replica gets disconnected or when data movement is suspended on the secondary database. This state also prevents log truncation, so if this state persists, we recommend that you remove this secondary database from the availability group. The above is a snippet from the official Microsoft documentation for Availability Group Secondary Replicas under the limitations and restrictions section. So a transaction on a secondary replica can block an operation on a primary replica… Hmm.. Now that smells like a mystery! Before I go further, let me explain what Ghost Cleanup does. Let me give you the official text from the Books Online. Deletes operations from a table or update operations that cause a row to move can immediately free up space on a page by removing references to the row. However, under certain circumstances, the row can physically remain on the data page as a ghost record. Ghost records are periodically removed by a background process. This residual data is not returned by the Database Engine in response to queries. I had some free time a while back and decided to actually track this down to show how the Ghost Cleanup actually works in an availability group replica. My availability group setup was a simple one which had two SQL Server instances sitting across two different subnets as shown in Screenshot 1. So, let’s get the show on the road and let me walk you through walk you the through the ghost cleanup behavior on the secondary replica. As you can see from the green highlight above the Transaction ID is 11899 (0x2e7b) which inserted a row on Page ID 315 (ox13b). I verified that the page on the primary replica database had the new entry that I had added into the heap using the Page ID retrieved from the transaction log. Note that we are keeping track of the oldest active transaction as well. 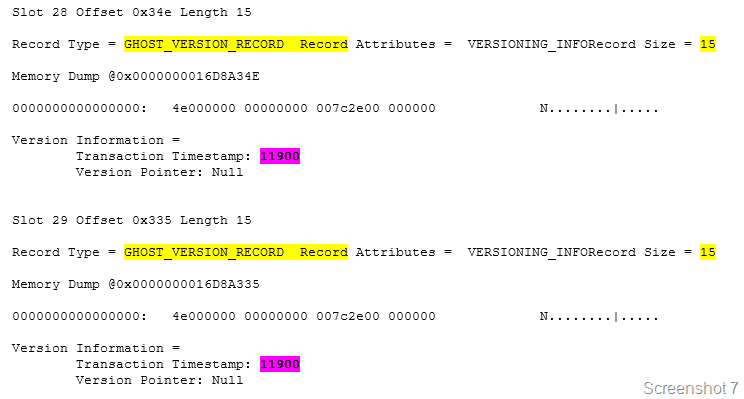 The record shows the transaction timestamp which was responsible for the DML operation 11899 (0x2e7b). From Screenshot 2 below, you can see that the version information is maintained and the transaction timestamp shows up correctly (green highlight). The value also shows up correctly (pink highlight). Then I started a transaction on the secondary replica and executed a SELECT query on the same table with a HOLDLOCK hint to keep the row lock. Then I proceeded to delete both the rows with value 3 in the primary replica. I verified that the rows were not retrieved by a SELECT query on the primary and secondary replica. The transaction log dump from secondary replica shows that the changes were replayed. Oops! I had to read the transaction log again. From the green highlights in Screenshot 4, you can see that the GhostCleanupTask transaction ran on the secondary replica. The pink highlights shows that the transaction ID 11900 (0x2e7c) deleted two rows from the Page ID 315 (ox13b). So all is good now. Well curiosity got the better of me and I decided to check if the same the story was being told inside the transaction log of the primary replica database. And this is where David Duchovny’s a.k.a. 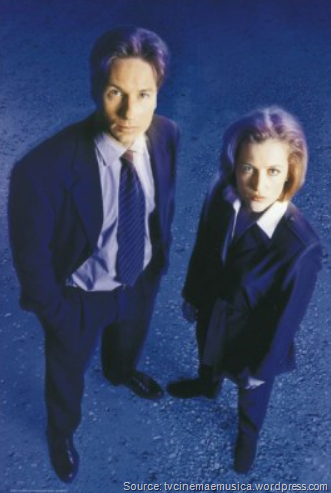 Agent Moulder and Gillian Anderson a.k.a. Agent Scully’s faces from the X-Files will be an apt representation of what I present next. The first observation is that the transaction log is being replayed to the letter on the secondary replica. Notice that the transaction IDs of the Ghost Cleanup Task correspond with the transaction IDs of the Ghost Cleanup Task found on the secondary replica instance database. It wasn’t a joke when the documentation said that transactions are replayed on the secondary replica! The yellow highlights show that the rows were deleted from the table that I had performed the delete on. The pink highlights confirm that the same transaction was associated with both the deletes. Why Ghost Cleanup Task was running repeatedly on the primary replica database? Since I had an open transaction on the secondary replica database, I had an active version store! 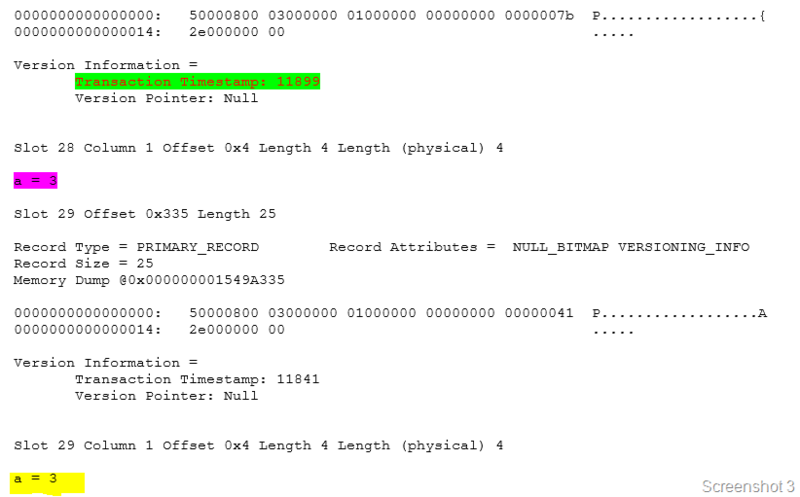 Screenshot 6 shows that my active version store on the secondary replica with a transaction sequence number of 11900 (0x2e7c) which matches the transaction ID of the delete operation. This active version stored was created on the delete operation because I had performed a SELECT with a HOLDLOCK earlier as mentioned in this post on the table from the secondary replica. Then I created a table on the primary replica database and inserted a row in it. I checked if this data was available on the secondary replica and it was! I found that on the primary replica, the database page shows ghost version records (Screenshot 7). The transaction timestamp matches the transaction ID which performed the delete operation i.e. transaction ID 11900 (0x2e7c). Once transaction which I had stated on the secondary replica with the HOLDLOCK hint was committed, the ghost cleanup task was able to perform the cleanup on the primary replica’s page. Once this was completed successfully, the ghost records on the secondary replica were cleaned up promptly as well. The above behavior is true for both synchronous and asynchronous modes of operation. I hope this was a fun Friday read! Have a good weekend! I had recently run into an issue where the MaxBCPThreads value was set to a non-zero value and the Snapshot Agent was still not creating multiple snapshot files for the table in question which was over 70GB in size. On further inspection, I did find that the issue was with the statistics distribution of the table in question was affecting the parallel file export by the snapshot agent. It has already been documented that the concurrent snapshot generation option prevents the use of parallel BCP threads by the Distribution Agent. This is documented on the ReplTalk blog on MSDN. Now to find out why the parallel threads were not being generated. So I created a repro of the situation on my side with a transaction replication publication having three tables with the same schema options. The snapshot folder after the snapshot agent’s execution is as shown in the screenshot. The tblNewArticle6 has 60398 rows, tblNewArticle3 has 100,000 rows and the tblNewArticle1 has 2 rows. The MaxBCPThreads configured value for the snapshot agent is 6. Surprisingly, tblNewArticle6 has 12 BCP files and the tblNewArticle3 has only one BCP file. 1. There is a thread which performs an exploration on what ranges the parallel BCP threads will be fetching. 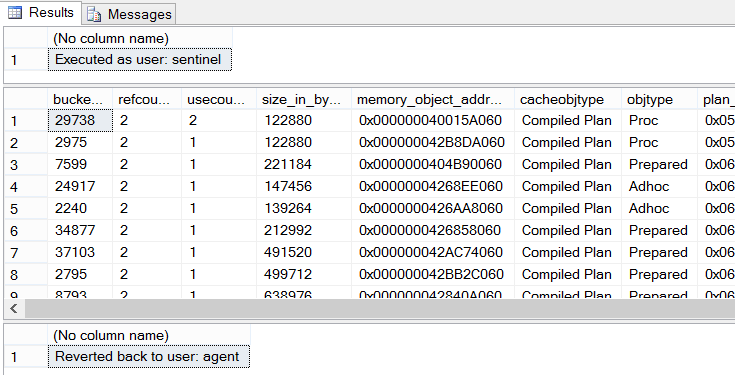 The application name in the profiler trace will show up as “Auxiliary bcp load ordering hint and partitioning resolution thread # for publication <publication name>”. See Screenshot 2 for more details. 2. You will also find dynamic SQL commands executing DBCC SHOW_STATISTICS against the tables in question. In my case, tblNewArticle6 has a data distribution graph as shown in screenshot 3. It is clear from the screenshot that the tblNewArticle6 has multiple ranges available for the index id = 1. These were utilized by the Snapshot agent to generate 12 BCP files. The above ranges translated to 12 ranges which is the same number of files that I see in my snapshot folder. Now looking into tblNewArticle3 which has 100,000 rows, I have a DBCC SHOW_STATISTICS output which only showed me two distinct ranges. Another point to note was that the primary key of the table has a non-clustered index defined on it and the clustered index key is a non primary key column. On increasing the number of rows in the table, I still find that the number of rows in the table, tblNewArticle3, I still found that the number of BCP files that were being generated was only 1. Then on additional investigation, I found that there is a small requirement of the clustered index to contain the primary key columns for the published article as well. This is evaluated in one of the system stored procedures for replication. 1. There are multiple distinct ranges available in the clustered index’s statistics histogram to create partitions which can be used by the BCP program to extract the data in parallel. 2. The clustered index must be defined on the primary key columns. 3. MaxBCPThreads value is set to a value other than 1. A question was posted on Twitter’s #sqlhelp hashtag on how to allow non-sysadmin accounts or accounts which do not have the View Server State privilege to fetch the cached query plans. This can be a very big deal if you are a hosting company for databases. You would want to restrict access to all non-admin users but at the same time you might need to give your customers and their developers access to their query plans to assist with their query tuning efforts. The first thing that comes to mind is to use impersonation in SQL Server. Implementing it is where the fun is! Let’s consider this hypothetical scenario. I have a SQL Server login named Sentinel which would be granted View Server State privileges only. I have another SQL Server login named Agent which is neither a sysadmin nor a login with View Server State privileges. The Agent login need to look up plans of stored procedures which are executing in the current database. The first task would be to grant View Server State privileges to Sentinel and impersonate privileges to Agent. Next I create a stored procedure which allows the login agent to see the cached plans which are available for the current database context. Cannot find the user ‘agent’, because it does not exist or you do not have permission. The server principal “sentinel” is not able to access the database “Test” under the current security context. This is because of the fact the login sentinel does not exist in the database Test in which the stored procedure exists. Next I will create a database user mapped to the login sentinel. Now when I used the stored procedure, everything works!! Screenshot of the output is shown below. 4. Grant execute privileges on the stored procedure which was created in Step #2. Voila… You are now ready to impersonate and view the query plan!